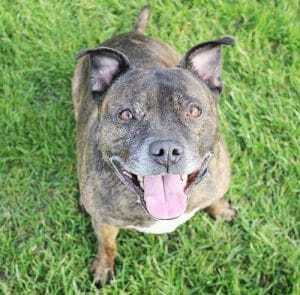 Lovely Bella is a sweet natured, mature Staffy lady who came into the care of Rain Rescue in Rotherham, South Yorkshire due to her owner’s change in circumstances. She’s been very much loved her whole life and longs to be someone’s princess once more. Maybe with a few less treats and a bit more exercise though, bless her! Bella is used to a quiet home with company most of the time. She could possibly live with sensible teenagers as long as there’s not too much coming and going. She likes her walks and is good when meeting other dogs out and about. She likes being the centre of attention at home though, so it’s thought she’d be happiest as an only dog. Bella is spayed and healthy, just a little too rotund. She had cruciate ligament surgery in the past but is fine now. 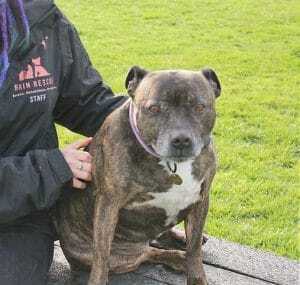 If you can offer this affectionate girl the loving home she seeks, please fill in Rain Rescue’s online enquiry form. 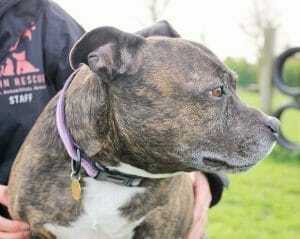 Please say you saw Bella on the Oldies Club website.